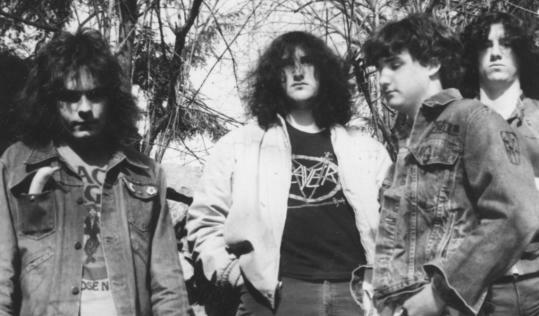 Many consider the definitive Post Mortem lineup to have been (from left) John McCarthy on vocals, John Alexander on guitar, Rick McIver on drums, and Mark Kelley on bass. Voice suffused with teenage rage, John McCarthy sliced through lyrics as lead singer for Post Mortem, a band that emerged from Belmont High School in the mid-1980s and helped pioneer the underground subgenre of death metal. Beneath the sometimes unprintable lyrics he sang, though, lurked a musicologist with such far-reaching tastes that he drew inspiration from the kinds of demure acts that would make a metalhead feel faint. Fans may have viewed him as a younger, angrier Lou Reed, but Mr. McCarthy saved his greatest admiration for a gentler performer. "He'd say, 'I want to have a song that's beautiful, like Neil Diamond, on one of our records,' " recalled John Alexander, a Belmont classmate who was Post Mortem's guitarist. "And we were like, 'Are you crazy?' But he was always true to himself." Mr. McCarthy, who had planned to fly to Seattle next week to record vocal tracks for the first Post Mortem album in years, died Jan. 27 in his Athol home. He was 40. The family is awaiting results of tests to determine why he died, said his brother, Jesse Robinson, who added that Mr. McCarthy had struggled with diabetes and a pancreatic illness. With albums such as "Coroner's Office," "Festival of Fun," and "Destined for Failure," Mr. McCarthy and Post Mortem built a following that began by listening to their LPs on vinyl and eventually sampling songs at www.myspace.com/postmortem or on iTunes. But perhaps true to the underground nature of the music, some of the band's early shows drew strong reactions. "We had a lot of experiences where people hated us," said Alexander, of Redmond, Wash. "People threw stuff at us. You don't go out hoping to have people hate you, but when you get that reaction, you use it. Those were the most memorable shows." Or as Mr. McCarthy told the blogger Metal Mark late last summer: "I really loved beer bottles, spit, ice, tables . . . being attacked," calling those "fond memories." Robinson noted that his brother was "very funny, witty, and . . . very eccentric, and he used to love saying things that were very nonsensical." Well-read and deeply versed in the minutia of musicians he admired, Mr. McCarthy kept a notebook handy "and he was always jotting things in it," Alexander said. "He was very observant and constantly writing in his book, and a lot of times he would turn what he was writing into song lyrics. You'd rarely see him without his little notebook. I was talking to him recently, and I think he had 30 or 40 of these notebooks filled with what he had written." Alexander met Mr. McCarthy before they were old enough for elementary school, when their families lived a few houses apart. They became closer in middle school and early high school when "there were very few people who listened to underground music, and they gravitated together," Alexander said. "There were probably 10 people total, and we all hung out together." Although he made his name in thrashing, underground music, Mr. McCarthy was a fan whose tastes bounded from genre to genre. He loved Sly and the Family Stone as a young child. He listened to the Beach Boys and the Beatles. "He wasn't just death metal all the time," his brother said. "One of his favorite bands was ABBA. He was totally open-minded when it came to music." Initially a good bass player, Mr. McCarthy started singing because an earlier band he was with needed a vocalist, said Alexander. The two of them joined Post Mortem while at Belmont High School, and the band built its fan following on the road. "I think when we were 16, we toured most of the East Coast," Alexander said. "It's bizarre, thinking back on some of this stuff. I have three kids now, and I can't imagine why my parents let us do it." What Post Mortem members consider the definitive lineup - Mr. McCarthy on vocals, Alexander on guitar, Mark Kelley on bass, and Rick McIver on drums - coalesced in 1985 and lasted, with some interruptions, until 1994, the year after the release of their last full-length album, "Destined for Failure." During those years, Mr. McCarthy also sang off and on with other area bands, including Solitude and Ointment. "He was a singer for hire," Alexander said. Since Post Mortem split, Mr. McCarthy spent most of his time in the Athol area, to be closer to his mother and siblings, and he worked some "crummy jobs," Robinson said. Mr. McCarthy, who wrote most of the lyrics for the new album, planned to fly out Wednesday and stay with Alexander while recording the vocal tracks. McIver also wrote lyrics for Post Mortem, said Alexander, which gave the band a dual identity. "Rick's lyrics were very graphic, gore kind of stuff," he said. "One of the struggles John had with Post Mortem was singing the gore lyrics. They didn't resonate with him, but when you're dealing with other individuals, you have to compromise." By comparison, "if you look at John's lyrics, it's more personal, deep," Alexander said. "I think over time, that's why people gravitated to him. His words seemed to affect people differently." In addition to his brother Jesse, Mr. McCarthy leaves his mother and stepfather, Diane (Rizzuto) and William Robinson of New Salem; his father, John L. Sr. of Boston; his son, Matthew of Cambridge; another brother, William Robinson of New Salem; two sisters, Theresa Robinson of New Salem and Angelina Mavilia of New York City; and a granddaughter. A funeral Mass was said.